This information about conservation is from the NGV website. How do you look after a 500-year old drawing, or restore an ancient Egyptian mummy case? This is the work of NGV conservators who preserve, examine and restore artworks in the Gallery’s care. Much of their work is hidden from view in conservation laboratories, but it can be seen in the condition of the artworks on display, and in the gallery environments that surround them. Light, dust, temperature, humidity – all these things can damage artworks. Preventive conservation provides a safe environment for artworks when they are on display, in storage and during handling and travel. This includes the controlled lighting, temperature and even the ‘please do not touch signs’ in the Gallery. Remedial conservation involves treating artworks to keep them in good condition. For example, oil paintings were traditionally finished with a layer of natural varnish. Over time this varnish can discolour, and needs to be removed or replaced. Sometimes more complex treatments are required, often because an artwork has been damaged. For example, in 2002, the Gallery acquiredSpring 1890 by Arthur Streeton. It was in a poor condition, having been inexpertly restored, and also coated in estapol. NGV conservators successfully restored the painting as the artist intended it to be seen. Conservation is highly specialised work that requires art and science knowledge and skills. It includes technical analysis of materials and processes used to make artworks. This can involve examining artworks using microscopes, infra-red photography, X-rays or other technology. Art history research also provides important information about art materials, processes and artistic intentions, helping conservators apply the right treatment to an artwork. The aim of their treatments is not to make artworks look like new; their work respects the artist’s intention and the history of the artwork. Conservators document their work to add to knowledge of the artwork and to inform further treatments should they be needed. In preparation for the exhibition Australian Impressionism in 2007, NGV conservators undertook an extensive technical examination of Tom Roberts’s iconic painting Shearing the rams. 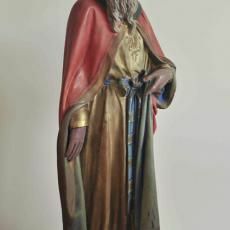 This guided the restoration, which involved removing a layer of heavily discoloured varnish and repainting (believed to have been done by restorers more than 100 years ago) to reveal Robert’s original brushstrokes and tones. An X-ray image of the painting also revealed evidence of changes made by Roberts during the process of making the painting. The back of the central shearer was originally almost horizontal but in the final painting it is on an angle that echoes other diagonal lines in the composition. This shearer was also originally clean-shaven. In 2008, after extensive technical and art history research, NGV conservators discovered the identity of the artist and the subject of a mysterious Renaissance portrait in the Gallery’s collection. Lucrezia Borgia, the Duchess of Ferrara is the subject, painted by Dosso Dossi (c. 1486–1542). Conservation work on the lid of the coffin of Tjeseb has involved significant scientific research, including an analysis of the paint layer to identify the pigments used. With the help of digital technology, NGV conservators have also created a visual reconstruction of the lid to determine what fragments may be missing. 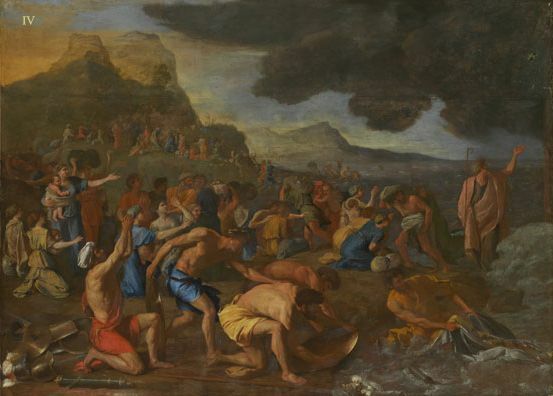 Witness the transformation of Poussin’s Crossing of the Red Sea in this slideshow chronicling the various stages of conservation treatment: the removal of old varnish and restorations, the application of a new varnish, and the gradual process of inpainting the lost and worn passages of paint. If you look closely you will notice the changes first in the lower half of the painting, then up through the mountains and landscape, and finally throughout the sky. Preventive Conservation in the Context of a Historic House Museum: A Case Study - The case study provides an important opportunity for students to explore the complexities involved in weighing options and making decisions about environmental control and use of historic spaces and collections, particularly in situations in which no clearcut right approach is apparent. The case integrates the expertise and viewpoints of other professionals, requiring students to consider conservation issues from several perspectives. This information is from the AICCM website.